The ornate, or western, box turtle (Terrapene ornata ornata) is a land-dwelling turtle found from throughout the central United States from the front range of the Rocky Mountains east to the Mississippi River Valley and north from South Dakota to the Gulf of Mexico. Adults are medium-sized turtles, not exceeding 6 inches in length. As with most species of land-dwelling turtle, they are relatively slow-moving. Their bright coloration earned them the common name "ornate" -- their top shell, or carapace, contains cream or yellow lines radiating in a sunburst pattern on each of their scutes. Individual patterns may vary greatly from individual to individual. Males often have bright orange or red speckles on their front legs and bright yellow or green heads. 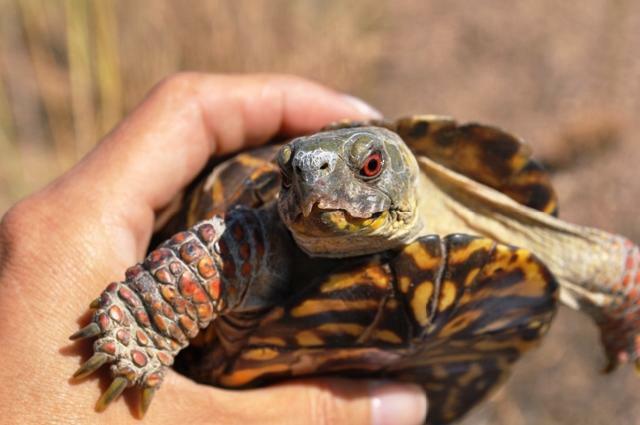 Population studies of the ornate box turtle have been conducted in Kansas, Wisconsin, and New Mexico. Research shows that these turtles inhabit a wide range of habitat and their behavior, size, hibernation, diet, and land use vary greatly in different regions. 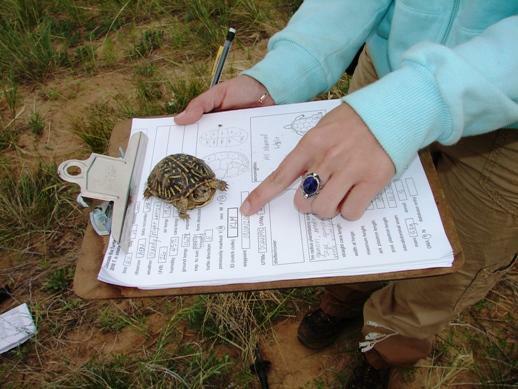 The Colorado Box Turtle Project will add to this body of knowledge by conducting the first long-term population studies here in Colorado.